I got this recipe from http://www.foodnetwork.com, and it’s a great summer recipe for a refreshing fruit salad. You can add some more fruit and/ or change the fruit in this fruit salad for some variation. Enjoy! Bring the wine and sugar to a boil in a small saucepan, stirring until the sugar is dissolved. Boil for 2 minutes. 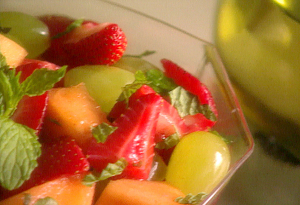 Remove from the heat.Chop and combine the cantaloupe, strawberries, grapes, and mint in a large bowl. Pour the warm wine mixture over; toss to coat. Cover and refrigerate until cold, stirring occasionally, at least 2 hours. Transfer to the fruit mixture to a wide jar with a tight-fitting lid. Keep chilled. Recently took this to a picnic and it was a great hit!! The mint really makes this a perfect summer treat!